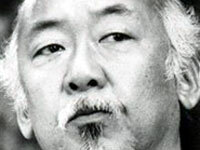 Pat Morita died today , so lets raise a glass to this fine character actor. Rumor has it he had just finished calling Nickie Goomba and was telling him how much he loved reading his blog when he just fainted and breathed his last . I had no idea he died. How sad, but I raise my glass, what a man! Hello: I hope you had a nice Thxgiving Pappy:) That is trippy that Mr. Morita died. I was thinking about my childhood and the karate kid the other day when I was kickboxing. Mr. Morita touched far more people than he ever realized. May he rest in Peace. I thought the world of this guy. You could tell he loved people. Also, two of my favorite movies. KC1 and KC2.